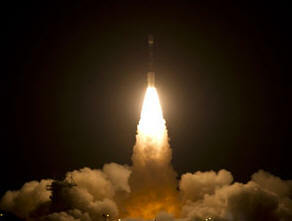 October 31, 2011 - America’s newest polar-orbiting satellite roared into orbit on Friday, setting the stage for enhanced weather data NOAA scientists will use to develop life-saving severe weather forecasts days in advance. In 2011, data from polar-orbiting satellites like NPP allowed emergency managers and communities to prepare for severe weather events. Five days before a destructive and deadly tornado outbreak in Alabama and parts of the Southeast in April, NOAA forecasters were able to see the early atmospheric signs of the storm system developing and issue timely warnings. NPP will orbit Earth every 102 minutes, flying 512 miles above the surface, monitoring atmospheric conditions below. The first of the NPP data will become available in about 90 days and begin replacing data from the NOAA-19 satellite in the afternoon orbit, passing over the United States during full daylight hours. NPP is also the bridge that links NOAA’s current polar-orbiting satellites to the next generation of advanced spacecraft called the Joint Polar Satellite System (JPSS), which is currently set to launch in late 2016, pending funding. NPP will test how the new instruments perform before they are formally added to the JPSS satellites. NOAA’s Satellite Operations Facility in Suitland, Md., will process and distribute the data from NPP. The originally planned launch of JPSS has been setback due to delays in funding over the past couple of years. This means there will be a data gap between the time NPP begins to degrade from the harsh space environment and the time JPSS is successfully placed into operation. The length of that gap depends on future years funding and the agency remains optimistic that current year Congressional support will carry over into a final appropriation and out-year funding. Dr. Kathryn Sullivan, assistant secretary of commerce for environmental observation and prediction and NOAA deputy administrator, hailed the successful launch of NPP as a credit to the long-standing partnership between NOAA and NASA. “This partnership works,” Sullivan said. “For more than 40 years, we have worked together fielding observation satellites to provide the nation with critical environmental intelligence to protect lives and livelihoods.” NOAA’s mission is to understand and predict changes in the Earth's environment, from the depths of the ocean to the surface of the sun, and to conserve and manage our coastal and marine resources.